House Hacker generates beautiful, professional reports that let everybody know you have done your due diligence. 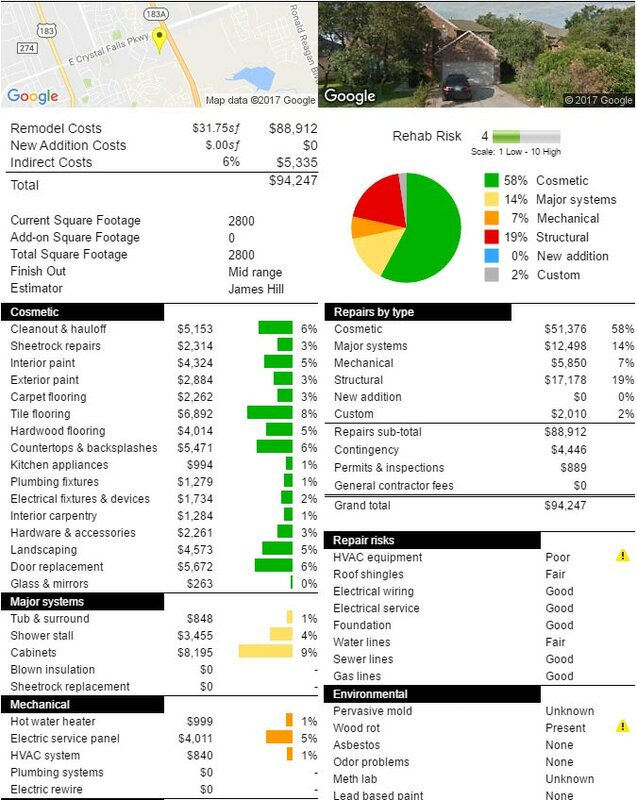 The rehab cost assessment report shows a detailed breakdown of the scope of wok and the cost of the repairs that your property needs to into marketable condition. Our color-coded repair cost breakdown is easy to understand and easy to share online with custom URL links that you can email or post online. You can even text a link to someone phone of you can send the report as a PDF attachment. Using our proprietary algorithm the Rehab Risk Index helps you determine the potential to lose money on a job. The higher the Rehab Risk Index the greater the skill level needed successfully complete a project. If you are an investor looking for a lender or equity partner... If you are a wholesaler trying to sell a property... If you are a Realtor trying to help your investor clients... Show everyone that you have done your due diligence with Househacker Reports.